Since its inception, WildCRU has sought to engage society with conservation through the wide communication of scientific research. Our founder, David Macdonald, is known for his outreach to the public, through popular films and books, as well as a wide scientific community in which he is frequently invited to give prestige lectures. Importantly, implementing education programmes for local communities where we operate is an integral part of the capacity building amongst our research projects. Our recent innovative approach to education is to develop board games that either can be educational in the tools of conservation science for students, or can appeal to non-scientists to demonstrate some of the challenges faced by conservationists, the animals themselves, or the indigenous people who live with them. 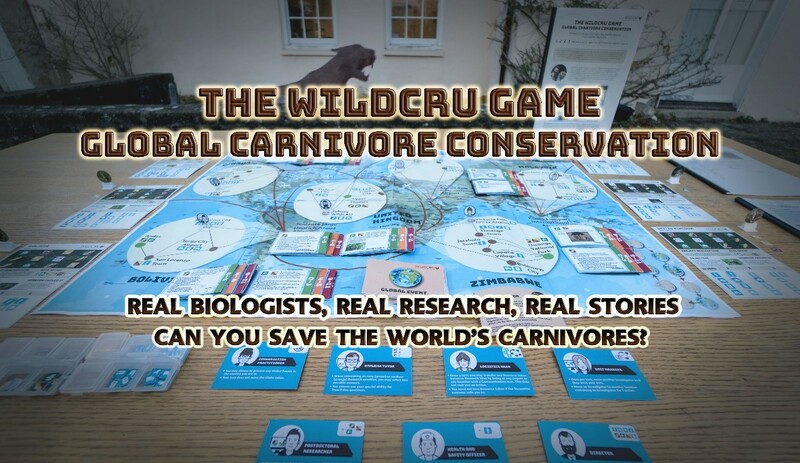 The most recent board game is the WildCRU Game, developed in 2017, where players work together cooperatively as WildCRU researchers to gather the resources needed for selected carnivore conservation projects across the globe, before using them to reveal their study sites for their native flora, herbivores, study species carnivore, and competing carnivores. With stories taken directly from the real experiences of WildCRU researchers, players must choose a likely action for their encounters in a ‘choose-your-own-adventure’ format to gather the field equipment (tents, ropes, torches), research equipment (radio collars, camera traps), personnel, and transport resources for their projects. Players also answer multiple choice ‘Research questions’ based on actual WildCRU research to reveal the contents of their study site, and with the more resources a project gains, the more of your study site can be revealed per question. The aim of the game is to complete the victory conditions of the projects your group has chosen before a lose condition occurs. Players face the additional pressure of ‘Global Events’, which occur periodically, and can cause serious problems for the players. Dr Cedric Tan is leading a programme of learning with innovative teaching methods, through gaming and role-play. 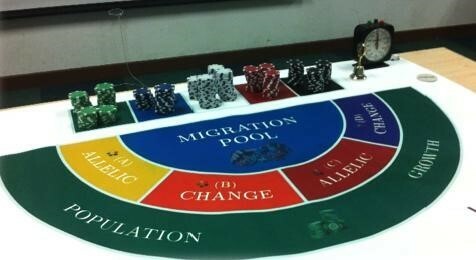 An example would be the ‘conservation genetics casino’, which he uses both with the classes of the Recanati-Kaplan Postgraduate Diploma in International Widllife Conservation Practice, and his Wildlife Conservation Course, which began in 2015, and has run annually at the University of Nottingham Malaysia campus. In the game, the five colours of chips represent different genetic characteristics in a population of animals. Green might mean resistance to disease, blue might mean adaptability to climate-change induced weather patterns, and so on. The players have to bet, rise or go all-in to give their population the most diverse set of genes possible – exactly what a real population of animals would need in order to survive in the increasing fragmented forests across Southeast Asia, where Cedric has been conducting research on clouded leopards. Beyond functioning as teaching tools, these games are also educational experiments. In collaboration with Associate Professor Ahimsa Campos-Arceiz and Dr. Jiin Woei Lee from the University of Nottingham Malaysia campus, Cedric’s research team has recorded behaviour, grouped students into teams based on their personality types, and observed the details of interaction and effectiveness of the course. The findings will help create education that truly inspires. Cedric’s research is based on the integration of psychology, arts and social sciences, but his heart is with environmental conservation. His research and courses are thus providing an invaluable service to the countries in Southeast Asia, a region which is exceptionally rich in species diversity but struggling with environmental degradation at every turn. Malaysia – and all of Southeast Asia – needs more citizens and professionals engaged with conservation. Eco-Divo [https://www.tes.com/teaching-resource/eco-divo-a-card-game-build-a-food-web-using-uk-species-learn-about-ecosystems-and-biodiversity-11307445]: an educational card game which teaches players about ecosystems and biodiversity. Players will explore the fascinating natural history of organisms in the United Kingdom, and discover species interactions, human impacts and diversity, while competing or collaborating in building a fascinating food web. The Roundtable for Sustainable Palm Oil Smallholders Board Game [http://www.rspo.org/smallholders/rspo-smallholders-boardgame]: a four-player game teaching players about the smallholders involved in the sustainable and best practices of palm oil production and supply. WildCRU is committed to the use of education as a tool to increase environmental awareness and spread the message of conservation. 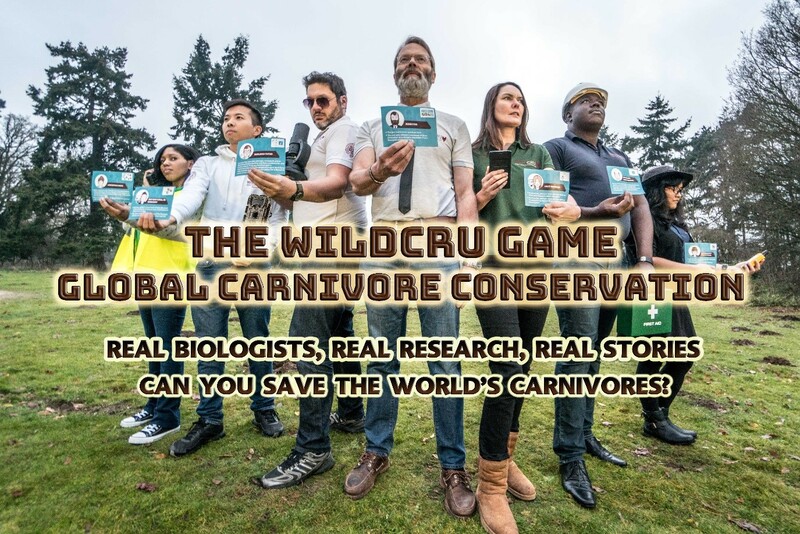 With innovative new approaches, such as board and role-playing games, WildCRU hopes to reach a wider variety of people, and introduce them to the science and processes behind real-world conservation issues.